Airline Virgin Blue has blamed an IT system error for accidentally upgrading ineligible members of its Velocity rewards program to “gold” status. An unknown number of customers received an email this evening saying: “We’ve got a treat for you - a free upgrade to Velocity Gold! Given you came so close to making it on your own, we wanted to say thanks so much for your ongoing commitment to the Virgin Blue Group, we really love having you around”. Gold status allows Virgin Blue Velocity members free access to Virgin Blue lounges, priority check-in at terminals, extra luggage and two personalised baggage tags. The Velocity website appeared to crash at 6:40PM AEDST Friday, hinting that a large number of customers had visited the site to find out if the upgrade was true. 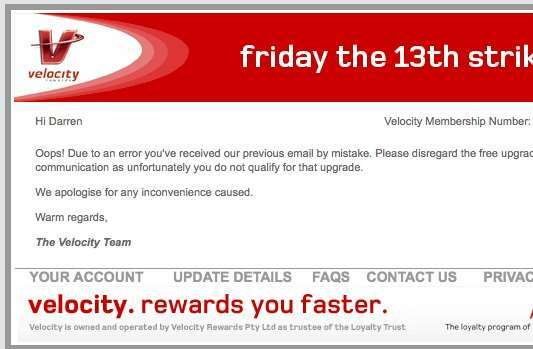 An hour later, Virgin Blue issued a correction on its Velocity rewards website. "Oops! Due to an error, you may have received an email regarding a Gold upgrade by mistake," the statement read. "Please disregard the free upgrade communication. We apologise for any inconvenience caused." The airline also posted to its official Twitter account that Friday the 13th had struck. A call centre representative from Virgin Blue said that the email was “a system error”. “IT have advised that we do have a system error,” the representative said. “Right now we do have a lot of phone calls because of this error." Before the offer was retracted, hundreds of Twitter users expressed their delight that they had been upgraded to Velocity gold status. “I just made Virgin Blue Gold! Never even saw Silver,” said Twitter user vbthedog. But members started wondering if the upgrade was legitimate after other Twitter users started to receive the email as well. “I wonder if that is a mistake and everyone who has ever flown virgin blue is now a Gold Member,” said Twitter user seanpryor. Velocity member, Ben Haylock, told iTnews he was “ticked” off the email was sent in error. “I'm ticked it was an ‘error’, as it contained my membership number [and] greeted me by name,” said Haylock. Danu Poyner, another member, told iTnews he was also “upset”. Jodie Miners, another member, said she was “disappointed”. “The fact that they haven't yet issued another email saying it was an error yet is really not good enough,” Miners said. “At the very least they need to give all affected people a free flight voucher or some form of compensation." But Velocity member Shaun Ewing wasn't too concerned. "Doesn't really bother me if it is a mistake," said Ewing. "I wasn't expecting it". Did you receive the email? Let us know in the comments below or email editors@itnews.com.au.